When I was volunteering at Ock Pop Tok in 2011-12, I used to sometimes take a break to visit Mon and watch her weave beaded patterns on her Katu backstrap loom. Mon stretched her warp between the two bamboo beams held by the balls of her feet and the front beam attached to the backstrap sitting around her hips. She controlled the tension with her foot movements, moving her feet a little toward her to slacken the warp when opening the shed and whenever positioning a bead. I don’t have it on video, but I remember Mon repositioning the two bamboo beams held by her feet regularly, perhaps every row or two. She seemed to be moving the lower one up and letting the other drop behind it. I should have asked her about it, but it seemed to me that this may have been a way of maintaining even tension across her warp. Mon stored her pattern with several string heddles attached to rods, and had a few more pattern rods behind those. 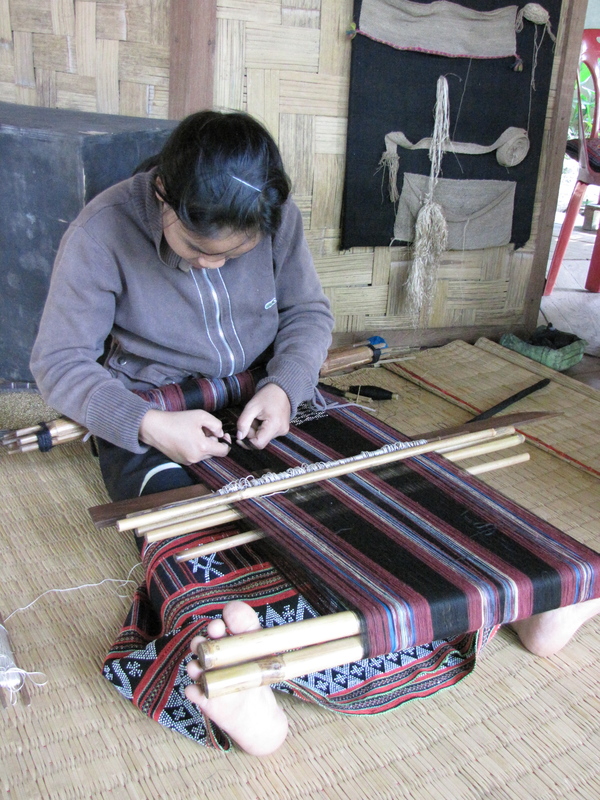 She drew several beads down before weaving each pattern row, positioning them between the warp ends after she had thrown that weft pick (see her feet adjusting the tension as she does this). Mon has great freedom to set up her loom anywhere that she can stretch out her legs, without needing to find an anchor point to tie her back beams to. This loom is also wonderfully portable and Mon would just roll the whole thing up when she was finished for the day. This entry was posted in Lao Techniques, Laos and tagged backstrap, bead, ethnic, Katu, Laos, loom, Luang Prabang, Ock Pop Tok, traditional, tribal, weaving by Wendy Garrity. Bookmark the permalink.